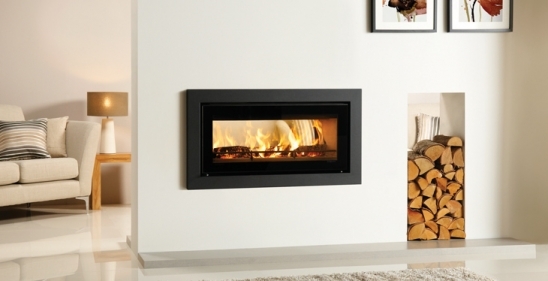 The Riva Studio 2 Duplex is the first double-sided cassette fire to be introduced into the Stovax Riva Studio range. Offering the ultimate in versatility, each side of the Duplex can be styled with a completely different frame option from the existing Riva Studio range! From the clean finish of the contemporary Edge to the opulent stone Pienza, or the sparkling Glass to the bold curved Verve, you can achieve a distinctive look in each room, whilst enjoying the rolling flames from the very same fire. In terms of performance, the Riva Studio 2 Duplex is matched only by its single sided equivalent, offering a highly efficient firebox with an impressive heat output of up to 9kW. The Duplex can additionally benefit from Stovax’s new optional Sealed Air System that will eliminate almost any draft from within the room. Whether as a centrepiece to an open plan living space, or as a connecting feature between two separate rooms, the Riva Studio 2 Duplex offers an undeniably contemporary aesthetic and the ultimate appeal in dual space heating.